This species is accepted, and is native to Europe, Egypt and Asia-Temperate.. Annual herb with fine taproot. Stem up to 70 cm. high, erect, simple to much branched, glabrous or with very scattered minute hairs. Leaves petioled, very sparsely pubescent, up to 10 cm. long, pinnati- or bipinnatipartite, with 2–4 pairs of lateral lobes; lobes linear, lanceolate or oblanceolate (in lower leaves even obovate), up to 3 cm. long; uppermost leaves sometimes simple, serrate. Racemes terminal, with comparatively conspicuous whitish flowers, in fruit lax, up to 25 cm. long; pedicels in fruit 3–6 mm. long, ascending to almost erect, straight, glabrous. Sepals green with membranous margins, elliptic, 1–1.5 mm. long, with scattered fine hairs. Petals white or violet, spathulate to slightly clawed, with rounded apex, 1.7–3 mm. long. Stamens with a single small nectarial gland between each of them. Ovary elliptic, emarginate, with projecting style. Siliculae elliptic in outline, 4.5–6.5 mm. long, 3–4 mm. broad, with prominent apical wings, deeply emarginate; style distinct, with stigma completely within or just level with the top of the sinus. Seed wingless, reddish brown, 2–3 mm. long, ± 1.5 mm. broad. Weed of arable fields; 1800–2000 m.
Commonly cultivated in regions away from the coast; naturalized in some places. Al-Shehbaz, I.A. (2010). 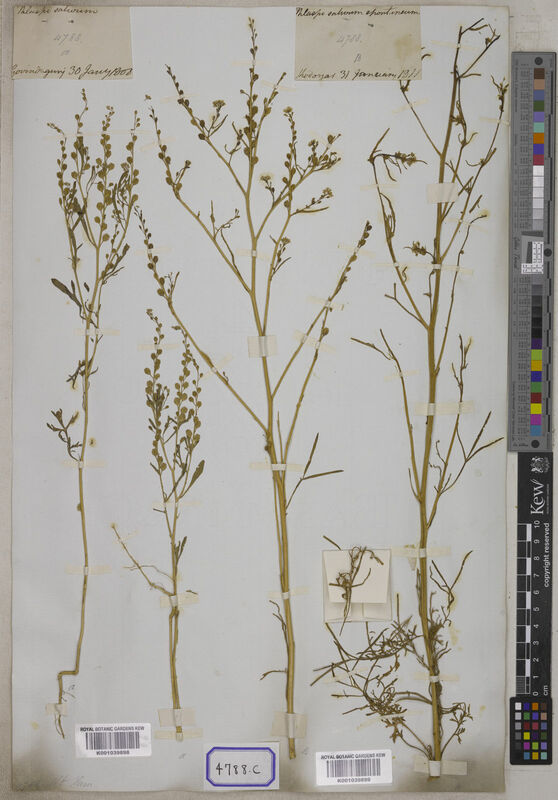 A synopsis of the South American Lepidium (Brassicaceae) Darwiniana 48: 141-167. Chev. Fl. Viv. 1: 197. Wickens, Jebel Marra in Kew Bulletin, Addit. Ser. 5: 86 (1976). Agnew & Stewart in A.D.Q. Agnew, Upland Kenya Wild Flowers p. 95 (1974). Franchetti in Adumbr. Fl. Aethiop. 7: 165, map 1 (1958). Cufod., Enumeratio Plantarum Aethiopiae Spermatophyta (Supplement in Bull. Jard. Bot. Brux.) p. 141 (1954). Keay, Flora of West Tropical Africa, ed. 2, 1: 98 (1954). F. W. 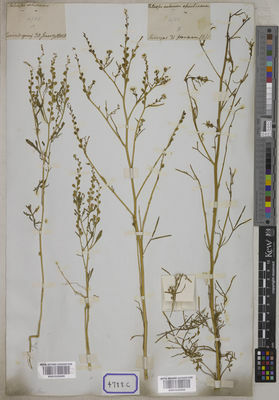 Andr., The Flowering Plants of the Anglo-Egyptian Sudan 1: 59 (1950). A. Chev., Fl. Viv. 1: 197 (1939). A. Engler & O. Drude, Die Vegetation Der Erde, IX, Pflanzenwelt Afrikas 3 (1): 262 (1915). Thell. in Die Gattung Lepidium : 121 (1906). Engl., Hochgebirgsfl. Trop. Afr. : 222 (1892). Oliv. in Flora of Tropical Africa 1: 69 (1868). L., Sp. Pl. : 644 (1753).